X-Bugs was listed in GAMES Magazine's "The Games 100" for 2004. 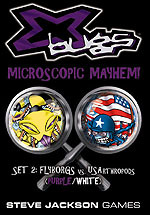 X-BUGS and all imagery © and ™ Nexus Editrice srl. 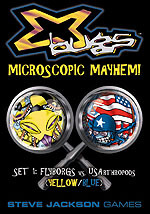 Discuss X-Bugs in the Steve Jackson Games Forums. Read a review at Ogrecave.com. 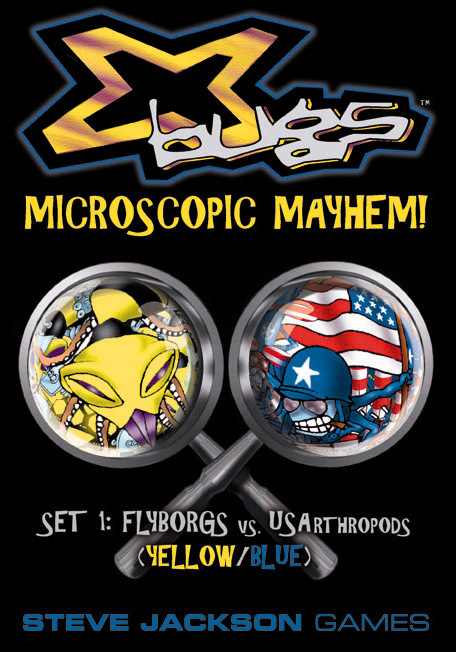 The alien Flyborgs are part machine, part bug. 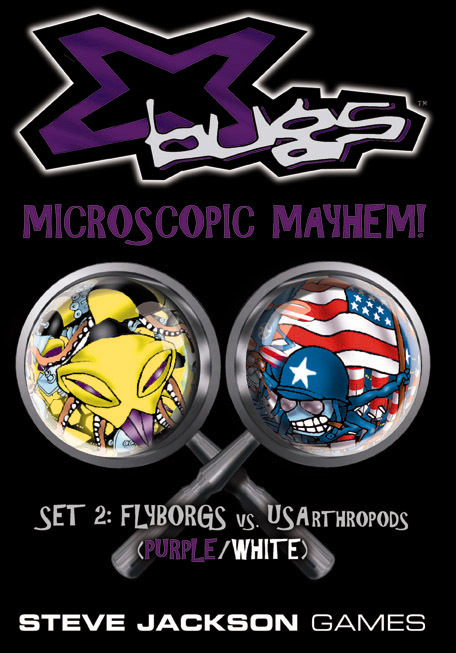 The flag-waving USArthropods have emerged from our Earth laboratories to stop the invaders! Set 1: Boxed game, with 6 large dice, rules, and lots of chips and stickers. Set 2: Boxed game, with 6 large dice, rules, and lots of chips and stickers. The Chitinians are a hungry swarm from outer space. The heroic Sovietoptera have come from Russia to protect the motherland! It's alien appetites versus Red ants . . .
AND . . . these armies also come in two versions. Set 3 has red Chitinians and green Sovietoptera chips. 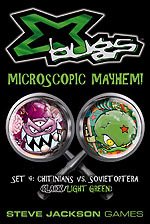 Set 4 has black Chitinians and light green Sovietoptera. With both sets, you can play a 4-player game, or fight a war between two armies of the same type. Set 3: Boxed game, with 6 large dice, rules, and lots of chips and stickers. Set 4: Boxed game, with 6 large dice, rules, and lots of chips and stickers.